or the Lambfold Benefice website. 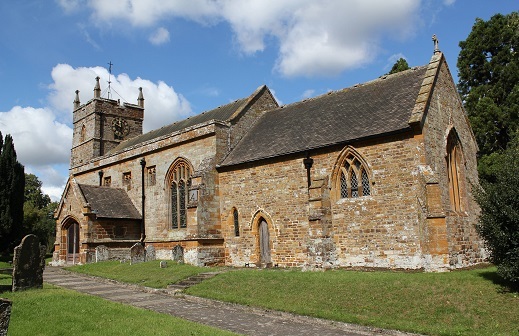 The Church is mostly 13th century and is constructed of local ironstone in the Gothic style, consisting of chancel, clerestoried nave, south porch and a western tower, with pinnacles containing five bells and a clock. The font is 14th century and is of plain stone. It was thoroughly restored and reseated in 1852. In 1874 a vestry was added and the chancel restored. More restoration work was done in 1929. For more detailed information about the building please visit the Farthingstone Church website; while if you want to know about services and times, please use the link here to the Lambfold Benefice website.